Recommended citation: Saidov K, Tiunova A, Subach O, Subach F, Anokhin K. New Tools in Cognitive Neurobiology: Biotin-Digoxigenin Detection of Overlapping Active Neuronal Populations by Two-Color c-fos Compartment Analysis of Temporal Activity by Fluorescent in situ Hybridization (catFISH) and c-Fos Immunohistochemistry. OBM Genetics 2019;3(1):18; doi:10.21926/obm.genet.1901065. Background: The method of cellular compartment analysis of temporal activity by fluorescent in situ hybridization (catFISH) is widely used in cellular and behavioral neurobiology. This technique exploits stimulus-induced expression of immediate early genes (IEGs) and allows identification of two neuronal populations activated in the brain of the same animal in response to neural or behavioral events separated by 25–30 min. The differential labeling is based on the visualization of nuclear RNA and cytoplasmic mRNA, which accumulates in neurons at different intervals after their activation. However, the drawback of this method is that the two RNA forms are labeled by the same color, which complicates their discrimination during image analysis. 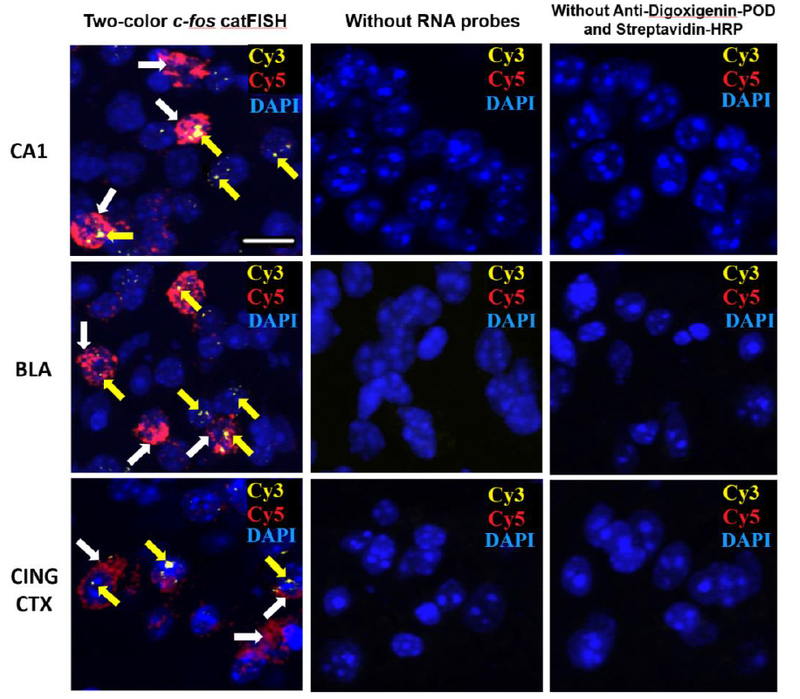 Methods: We developed a protocol for a two-color c-fos catFISH that allows visualization of cytoplasmic (stimulus 1) and nuclear (stimulus 2) RNA using the combination of digoxigenin- and biotin-conjugated probes. This approach was used to detect the intracellular localization as well as the spliced and unspliced forms of c-fos RNA by color-coded labeling. We also demonstrated the feasibility of combining this protocol with immunofluorescent detection of c-Fos protein, which allows visualization of two neuronal populations activated by stimuli applied 30 to 60 min apart. Results: We used the developed two-color c-fos catFISH protocol to identify neuronal populations activated in the mouse brain by two cognitive stimuli. 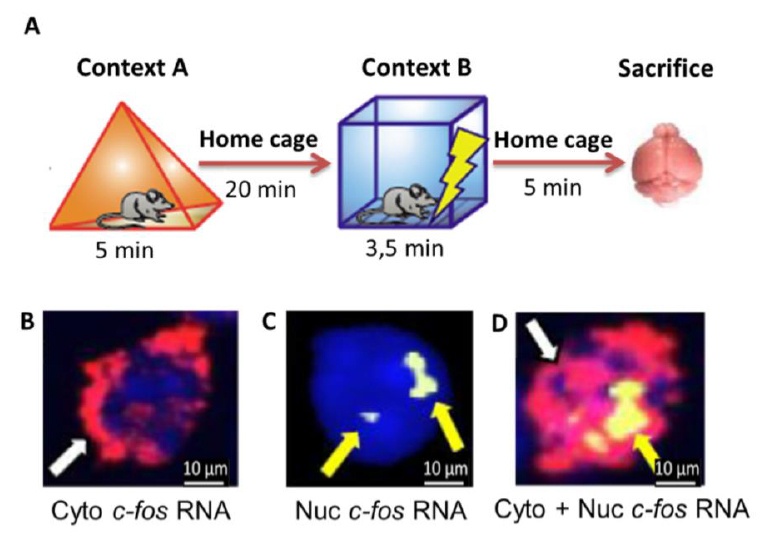 We identified two color signals that corresponded to cytoplasmic and nuclear c-fos RNA in different brain regions after mice were exposed to two different stimuli separated by 20 min. The two-color c-fos catFISH protocol was also combined with с-Fos immunohistochemistry, allowing colocalization of c-fos mRNA and с-Fos protein activated by two stimuli applied 60 min apart. Conclusions: The combination of the proposed approaches allows visualization of neuronal populations activated in the brain of the same mouse during two or more cognitive episodes in the time window of 60–120 min. One of the main approaches to understanding brain functions is to relate neuronal activity to animal behavior. Various methods of brain activity mapping by expression of immediate early genes (IEGs) allow the visualization of distributed neuronal populations involved in specific behaviors and facilitate identification of individual neurons activated during particular cognitive episodes. This neuroimaging approach is based on the regulation of IEGs, which are expressed at extremely low levels in the brain of quiescent adult animals, while new experiences induce their rapid and intense activation in nerve cells . The RNA transcripts of IEGs that encode transcription factors (c-fos, egr-1) or cytoskeletal proteins (Arc) appear in the neuronal nuclei 2–5 min after the onset of neuronal activation and disappear within 20 min, when these transcripts start to accumulate in the cytoplasm, reaching maximum levels 30–40 min after the initial neuronal activation . These dynamic characteristics of IEG expression can be used to distinguish and compare two sets of neurons involved in two discrete cognitive events separated by approximately 30 min. In this situation, the population of neurons activated by the first episode will contain the mRNA transcript in the cytoplasm, while the RNA in neurons activated by the second episode will be located in their nuclei. This pattern of expression can be visualized using the catFISH method or cellular compartment analysis of temporal activity by fluorescent in situ hybridization (FISH). Initially, catFISH was based on single-color RNA probe labeling and nuclear counterstaining to allow localization of the RNA . A more advanced method exploited the use of different probes labeled with separate markers of the intronic part of the gene and the cytoplasmic transcripts, thus allowing visualization of two probes labeled with distinct colors . In the present study, we developed an improved biotin-digoxigenin protocol for two-color catFISH allowing identification of neuronal populations activated in the mouse brain by two distinct cognitive stimuli. For this labeling, we created exonic and intronic RNA probes for one of the most studied IEGs, the c-fos gene. C-fos encodes a transcription factor that regulates the expression of several other genes and is widely used as a marker of experience-dependent neuronal activity and plasticity in the brain [5,6]. Furthermore, we developed a protocol for combined fluorescent visualization of c-fos mRNA by in situ hybridization and c-Fos protein by immunohistochemical (IHC) staining, which allows detection of neuronal ensembles involved in two cognitive episodes separated by more than 60 min. This extended time window significantly broadens the repertoire of the behavioral and cognitive task protocols that can now be used to study the underlying neuronal assemblies and their links. All experimental procedures were carried out in accordance with the Directive 2010/63/EU of the European Parliament and of the Council of the European Union on the protection of animals used for scientific purposes (Section 27) issued on September 22, 2010, and Order № 267 Ministry of Healthcare of the Russian Federation (19.06.2003). This study was approved by the Local Ethics Committee for Biomedical Research of the NRC Kurchatov Institute (Protocol №1, 09.07.2015). Adult C57BL/6J mice (aged 10–14 weeks, n = 10) were housed in groups of 3–4 and maintained on a 12:12 h light/dark cycle with light from 9 a.m. to 9 p.m. and ad libitum access to food and water. All experimental procedures were conducted using a Video Fear Conditioning System (MED Associates Inc., Vermont, USA). Naïve mice were placed into a chamber to explore context A for 5 min. Context A consisted of a box (30 cm x 23 cm x 21 cm) with three metal walls and one transparent (Plexiglas) wall with a triangular insert inside. The floor of the cell was covered with sawdust. For the c-fos catFISH visualation, 20 min after their exposure in context A, the animals (n = 5) were placed into another experimental chamber (context B) and allowed to explore for 3 min, at which point the mice received a footshock (1 mA, 2 s) and were left in the chamber for another 30 s. Context B consisted of a box (30 cm x 23 cm x 21 cm) with the front transparent Plexiglas wall, a non-transparent white plastic insert encircling the other walls, and a metal rod grid floor. The animals were sacrificed by decapitation 5 min after the training in context B. For the combined FISH/immunocytochemistry c-fos detection, mice (n = 5) were placed into the context B 60 min after exposure to context A. The mice then underwent fear conditioning as described previously and were sacrificed by decapitation 30 min after exposure to context B. Immediately after each training episode, all animals were returned to their home cage. In a separate experiment, we used our c-fos catFISH protocol to compare neuronal populations activated by two consecutive tests of trained animals in different contexts. Mice from the experimental group (n = 4) were trained in contexts A and B as described previously with a 24-h interval between training sessions. 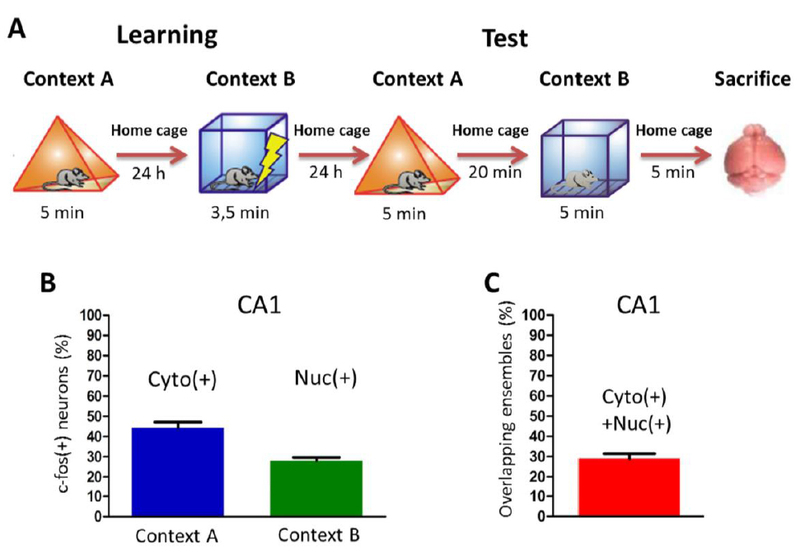 Mice were tested in context A and context B for 5 min per context, 24 h after the second training episode. The interval between the tests was 20 min, and the animals were sacrificed 5 min after the second test. The control mice were taken directly from their home cages without any training and sacrificed immediately. To construct the pSPT18-c-fos_exon plasmid, the full-size mouse c-fos gene (1,143 bp) was amplified by PCR as a HindIII-BamHI fragment using primers (Table 1) designed based on the cDNA_c-fos first strand DNA fragment and inserted into the corresponding restriction sites of the pSPT18 vector (Roche Diagnostics, Germany). Table 1 List of primers. The brain tissue of the C57BL/6 mice (Jackson Laboratory, Bar Harbor, Maine, USA) was homogenized using a SilentCrusher S homogenizer equipped with dispersing Tool 3 F unit (Heidolph Instruments, Schwabach, Germany) and total RNA was extracted using RNeasy Plus Mini extraction kit (Qiagen, Hilden, Germany). The cDNA_c-fos first strand DNA fragment was synthesized using reverse transcriptase RevertAid H Minus (Thermo Fisher Scientific, Waltham, Massachusetts, USA) with the mouse brain RNA as a template. To construct the pSPT18-c-fos_intron plasmid, the first intron of the c-fos gene (754 bp) was amplified by PCR from a fos-tTA plasmid (Addgene plasmid #34856) as a PstI-BamHI fragment and inserted into the corresponding restriction sites of the pSPT18 vector (Roche Diagnostics, Mannheim, Germany). Plasmids were isolated from Mach1 bacteria (Thermo Fisher Scientific) using Plasmid Miniprep and Midiprep kits (Evrogen, Moscow, Russia) and sequences of the c-fos_exon and c-fos_intron DNA fragments were confirmed (Evrogen) sequences. The plasmid templates were linearized by digestion with PstI (for the c-fos intronic probe) or HindIII (for the c-fos cytoplasmic RNA probe) and the probes were synthesized by in vitro transcription with T7 RNA polymerase. A DIG RNA labeling kit was used to make the digoxigenin-labeled c-fos intron probe and a biotin RNA labeling kit was used to make the biotin-labeled exon probe (both Roche) according to the manufacturer’s standard protocol; the probes were aliquoted and stored at –20°C. Animals were sacrificed by cervical dislocation. Brains were snap-frozen and stored at –80°C prior to processing. Coronal brain sections (20 μm) were prepared using a cryostat and arranged on glass slides (Superfrost Plus, Thermo Scientific). Slides were air dried and stored at –80°C prior to use. Before hybridization, sections were thawed at room temperature. All prehybridization solutions were RNase-free and ice cold. Sections were fixed for 5 min in 4% paraformaldehyde in phosphate buffered saline (PBS), washed twice in 2x SSC buffer and then in 0.1 M triethanolamine-HCl (TEA/HCl, pH 8.0), after which they were incubated for 10 min in 0.625% acetic anhydride in TEA/HCl. Subsequently, slides were rinsed three times in distilled water and incubated for 5 min in acetone/methanol mix (1:1). After two washes in 2x SSC, sections were covered with hybridization buffer (150 µl per slide), sealed with parafilm, and incubated for 30 min in a wet chamber at room temperature. Digoxigenin-labeled c-fos intronic and biotin-labeled c-fos exonic probes were diluted in hybridization buffer (1 ng/μl), heat denatured for 5 min at 90°C and chilled on ice before 150 μl of the solution was applied to each slide. Hybridization was performed for 18 h at 55°C. On the next day, the slides were rinsed in 2x SSC, incubated for 15 min with 2% H2O2 (Sigma) and blocked for 30 min with blocking reagent (Roche Diagnostics). Slides were then incubated for 2 h at room temperature with horseradish peroxidase-conjugated anti-digoxigenin antibodies (anti-DIG-POD, 1:1,000, Roche Diagnostics, Lot # 10520200). After washing in Tris-NaCl-Tween (TNT) buffer (0.1M TRIS-HCL, pH7.5; 0.15 M NaCL; 0.05 % Tween 20), the sections were incubated for 30 min in tyramide amplification solution (TSA Cy3, Perkin Elmer, Waltham, Massachusetts, USA). The brain sections were then incubated for a second time with 2% H2O2 in TNT buffer for 15 min followed by 2 h with streptavidin-conjugated peroxidase (Streptavidin-HRP, 1:1250, Perkin Elmer, Lot # 511170). Finally, the sections were incubated with TSA Cy5 (Perkin Elmer) for 30 min and counterstained with DAPI (Molecular Probes, Waltham, Massachusetts, USA). To confirm the specificity of labeling, control slides with adjacent brain sections were processed omitting either the mRNA probe or the anti-DIG-POD and streptavidin-HRP. A digoxigenin-labeled c-fos exonic probe was synthesized for this experiment. In situ hybridization was performed as described in section 2.3.3. On the next day, the brain sections were incubated for 2 h with anti-DIG-POD antibody and the signal was amplified using TSA Cy5. After completing the whole procedure, the sections were processed for IHC. Sections were pre-incubated for 1 h with 3% normal donkey serum (Abcam) and incubated overnight with rabbit anti-c-Fos antibody (1:100) at +4°C. The major part of the study was performed using Santa Cruz c-Fos antibody (SC-52). However, in our hands, other rabbit c-Fos antibodies (c-Fos - 226 003, Synaptic Systems) worked equally well. On the next day, the sections were incubated for 2 h at room temperature with Alexa Fluor 488 donkey anti-rabbit antibody (1:500, Invitrogen). All washing procedures and incubations were performed in 1x PBS. The nuclei were counterstained with DAPI. The specificity of staining was checked using control slides containing adjacent brain sections, which were subjected to the same procedures but without the mRNA probe or anti-c-Fos antibodies. Images were collected using an Olympus FluoView 1000 (Olympus Corp., Japan) confocal microscope at 40x magnification under water immersion. Images of the different brain regions were acquired by collecting z-stacks (1-μm thick optical sections) and were analyzed using the Imaris 7.4.2 program (Bitplane AG). Three sections at the CA1 level of the hippocampus of each brain were taken for image analysis. Analysis was performed by manual identification of nuclear, cytoplasmic and combined nuclear-cytoplasmic labeling at each optical level moving upward along the Z-axis. Neuronal populations activated by context A or context B was labeled by cytoplasmic only or nuclear only signals, respectively. Overlapping signals marked neuronal populations activated by both tests. The proportion of neurons activated by context A was calculated as the number of neurons with cytoplasmic staining per number of DAPI-labeled cell nuclei. Similarly, the proportion of context B-activated neurons was calculated as the number of neurons with nuclear staining per number of DAPI-labeled nuclei. The proportion of neurons with overlapping staining was calculated according to the following formula:nuclear & cytoplasmic c-fos co-label (nu (+) & cyto (+)) / [nuclear c-fos (+) + cytoplasmic c-fos (+)] – [nuclear & cytoplasmic c-fos co-label (nu (+) & cyto (+)] х100, where nuclear c-fos (+) represents the number of neurons with nuclear c-fos RNA labeling; cytoplasmic c-fos (+) represents the number of neurons with cytoplasmic c-fos RNA labeling; nuclear & cytoplasmic c-fos co-label (nu (+) + cyto (+)) represents the number of neurons with both nuclear and cytoplasmic c-fos RNA labeling; and total nuclei represents the total number of nuclei (detected by DAPI). Statistical analysis using Mann-Whitney test was performed in Prism 5.0 (GraphPad Software, San Diego, CA, USA). The level of significance was set at p<0.05. We used two training episodes in different contexts separated by a 20-min interval to activate distinct populations of neurons (Figure 1A). Initially, the animals were placed into a neutral context A (the first episode) and 20 min later trained using the fear-conditioning model in context B (the second episode) . As shown in Figure 1, the two episodes produced three types of labeled cells containing cytoplasmic c-fos mRNA (Figure 1B), nuclear c-fos RNA (Figure 1C), or colocalization of both RNA forms in activated neurons (Figure 1D). Cytoplasmic (exonic) c-fos mRNA was accumulated in activated neuronal populations within 30 min after training in context A, while nuclear (intronic) c-fos RNA appeared within 5 min after fear-conditioning training in context B. The neurons coactivated in both contexts were indicated by colocalization of cytoplasmic and nuclear c-fos RNA. Thus, after two cognitive episodes, we were able to visualize two populations of neurons that were transcriptionally activated by each episode or by both episodes by labeling with different colors. Figure 1 (A) Experimental design for visualization of neuronal populations activated in two distinct cognitive episodes using two-color c-fos catFISH. (B) Basolateral amygdala cell positive for cytoplasmic c-fos mRNA labeling (white arrow). C-fos mRNA was detected with cyanine 5 (pseudocolored red) and the nucleus was counterstained with DAPI (pseudocolored blue). (C) Basolateral amygdala cell positive for nuclear c-fos RNA labeling (yellow arrows). C-fos mRNA was detected with cyanine 3 (pseudocolored yellow) and the nucleus was counterstained with DAPI (pseudocolored blue). (D) Basolateral amygdala cell positive for cytoplasmic (white arrow) and nuclear (yellow arrow) c-fos RNA labeling. The nucleus was counterstained with DAPI (pseudocolored blue). Scale bar: 10 μm. As shown in Figure 2, we detected cytoplasmic, nuclear, or both c-fos RNA forms by two-color catfish labeling of the neurons in the CA1 hippocampal area, basolateral amygdala (BLA), and cingulate cortex (Cing.Ctx). No nuclear or cytoplasmic c-fos RNA signals were detected on the control brain sections (Figure 2). Figure 2 Representative images of neuronal populations activated in several areas of the mouse brain by the two experiences visualized using two-color c-fos catFISH. Cytoplasmic c-fos mRNA was detected with cyanine 5 (white arrows, pseudocolored red) and nuclear c-fos RNA was detected with cyanine 3 (yellow arrows, pseudocolored yellow). Nuclei were counterstained with DAPI (pseudocolored blue). Scale bar: 20 μm. Figure 3 demonstrates comparative analysis of neuronal populations activated by two consecutive cognitive episodes using two-color c-fos catFISH. Mice were trained in contexts A and B, and the neuronal ensembles activated by the retrieval of the corresponding memory were imaged and analyzed. The proportion of CA1 neurons activated by the retrieval of memory for each context (Figure 3В), as well as the proportion of neurons that were transcriptionally active in both contexts (Figure 3C) were calculated. Figure 3 (А) Experimental design for the analysis of neuronal populations in the hippocampal CA1 area activated by memory retrieval in the two training contexts. (В) Number of neurons activated by tests in contexts A or B as a proportion of the total number of DAPI-stained cell nuclei. (С) Number of neurons activated by both contexts as a proportion of the total number of activated neurons. Cyto(+) represents neurons active in context А. Nuc(+) represents neurons active in context В. Cyto(+)+Nuc(+) represents neurons active in both contexts. N = 4. Data represent the mean±standard error of the mean (s.e.m.). For combined detection of cytoplasmic c-fos mRNA and protein in activated neurons, the between-training interval was increased to 60 min and the animals were sacrificed 30 min after the second training (context B) (Figure 4A). 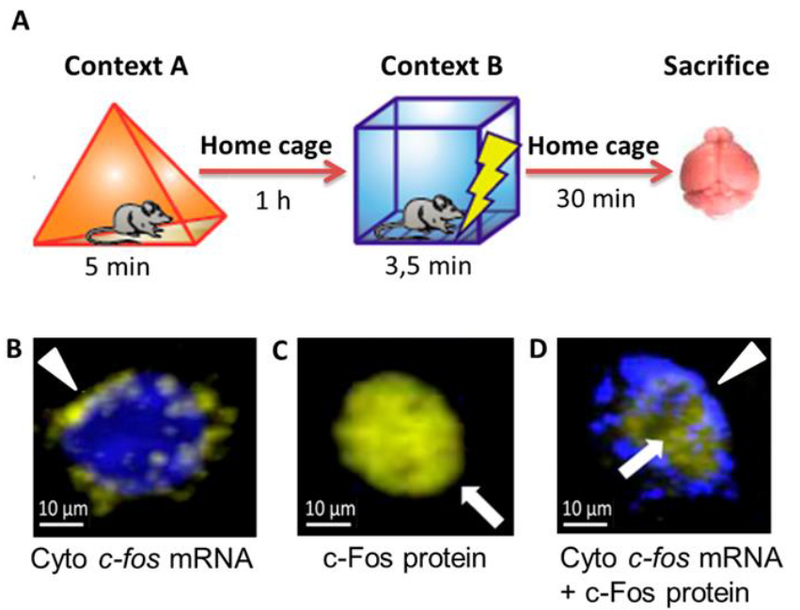 As shown in Figure 4, cells with cytoplasmic c-fos mRNA labeling (Figure 4B), nuclear c-Fos protein staining (Figure 4C), as well as both cytoplasmic mRNA and nuclear protein labeling (Figure 4D) were detected using two-color c-fos catFISH. Accumulation of c-Fos protein was detected within 90 min in the neurons activated during the first cognitive episode (context A), while the neuronal population engaged in the second cognitive episode were marked by cytoplasmic c-fos mRNA labeling. The presence of both cytoplasmic c-fos mRNA and nuclear c-Fos protein within the same neuron indicated the involvement of the neuron in both cognitive episodes. Figure 4 (А) Experimental design for visualization of neuronal populations activated by two distinct cognitive episodes using c-fos FISH combined with c-Fos immunohistochemistry. (B) Cingulate cortex cell positive for cytoplasmic c-fos mRNA (white arrowhead, pseudocolored yellow). The nucleus was counterstained with DAPI (pseudocolored blue). (C) Cingulate cortex cell positive for c-Fos protein (white arrow, pseudocolored yellow). (D) Cingulate cortex cell positive for cytoplasmic c-fos mRNA (white arrowhead, pseudocolored as blue) and c-Fos protein (white arrow, pseudocolored as yellow). No c-Fos positive cells were detected 30 min after the cognitive stimulation. Scale bar represents 10 μm. Thus, after exposing animals to two different cognitive challenges separated by 60 min, we detected populations of neurons that were transcriptionally activated during exposure to contexts A or B or both contexts (Figure 5). Neurons in the cingulate cortex exhibited c-Fos protein labeling in the nuclei of neurons 90 min after exposure of the animal to context A and c-fos mRNA labeling in the cytoplasm 30 min after exposure to context B. No cytoplasmic mRNA labeling was observed in the control sections with probe omission and no nuclear labeling was detected in the control slides processed without antibodies to c-Fos (Figure 5). Figure 5 Visualization of neuronal populations activated in the mouse cingulate cortex by two separate cognitive challenges separated by 60 min using the c-fos FISH/c-Fos IHC combined protocol. Cytoplasmic c-fos mRNA, c-Fos protein and cell nuclei are labeled with different colors. Nuclei were counterstained with DAPI. Cytoplasmic c-fos mRNA was detected with cyanine 5 (white arrowheads) and c-Fos protein was detected with Alexa Fluor 488 (white arrows). Scale bar: 20 μm. IEGs are widely used as markers of experience-dependent neuronal activity due to their low basal expression levels in the nervous system and rapid increase in expression in nerve cells involved in learning [8,9,10,11,12,13]. Expression of one of the most universal of these IEGs—c-fos—can be detected in brain samples several minutes post-training by in situ hybridization and 60 to 120 minutes after training by IHC staining [14,15,16,17,18]. However, these single-label approaches do not allow the identification of populations of neurons engaged in more than one episode of animal cognitive activity [19,20,21]. In contrast to classic in situ hybridization and IHC c-fos detection, the catFISH method facilitates analysis of populations of neurons activated in two cognitive episodes separated by an interval of approximately 30 min [22,23,24]. However, one of the main disadvantages of this method is the visualization of intracellular patterns of various types of mRNA with a single color, which complicates image analysis and limits the possibilities for automatic cell counting. In the classical catFISH protocol , both activity markers are labeled with a single color, which makes it difficult to distinguish these labels in one cell and represents a challenge to unbiased analysis of the results. This problem has been solved by using the combination of c-fos intronic and c-fos exonic probes labeled with different chromophores [25,26]. In this study, the first probe was labeled with 2, 4-dinitrophenol (DNP) and the second with digoxigenin. However, DNP is a highly toxic agent that requires the adoption of additional safety measures that limit the widespread application of this two-color catFISH method. Here, we describe a new two-color catFISH method based on the use of c-fos intronic and c-fos exonic mRNA probes labeled with digoxigenin and biotin, respectively. The plant-based protein digoxigenin is not present endogenously in animal tissues, which excludes non-specific staining due to adhesion of anti-DIG antibodies. Biotin, on the other hand, occurs naturally in the brain tissue, which increases the risk of false-positive results . To address this challenge, we used control slides of adjacent brain sections that were treated in parallel with the experimental slides but with the omission of the biotin-labeled mRNA probe. The control slides were examined using the same microscope settings as the experimental slides and no labeling was detected (Figures 2, 5). The commercial kits that are currently available for the synthesis of digoxigenin- and biotin-labeled mRNA probes make the probe preparation protocol simple and avoid the necessity for special safety measures. The advantage of the catFISH method is that it is based on the natural dynamics of IEG transcription and does not require any preliminary treatment of animals or the use of transgenic technologies [28,29]. Moreover, this technique can be used in any animal species for which the corresponding mRNA probes can be synthesized—birds, mice, rats, primates, invertebrates. These facts and the proposed two-color catFISH protocol make this method a suitable instrument for investigation of the distribution of neuronal populations in the brain that are activated in any two cognitive episodes separated by a relatively short interval. The combination of in situ hybridization and IHC protocols expands the options for visualization of neuronal populations, not only allowing identification of neurons activated in behavioral tasks by mRNA labeling but also evaluating their morphologic and cytological characteristics . Depending on the experimental aim, various proteins can be used as IHC markers, e.g., markers of different morphologic types of neurons in various cortex layers, and cytoskeletal proteins [31,32]. This double-labeling protocol includes FISH for mRNA visualization followed by incubation of brain sections with antibodies for specific detection of the protein of interest. Because of variation in the times required for accumulation of c-fos RNA (5–30 min depending on localization in an activated neuron) and c-Fos protein (60–120 min), we combined visualization of these products in brain sections after behavioral training in two different contexts. Thus, the time interval within which it is possible to examine the engagement of the same neurons in two cognitive challenges can be extended from 20–30 min to 1–2 h. In our study, neurons involved in the first cognitive challenge (context A exposure) were identified by detecting c-Fos protein 90 min after the episode, and neurons activated during the second challenge (training in context B) were identified by visualization of the DIG-labeled c-fos exon probe 30 min after the training episode. Using this approach, it would also be possible to add a third cognitive episode into the protocol just before sacrificing the animals and to detect a third population of neurons with two-color catFISH using an intronic biotin-labeled c-fos probe. The protocols described for two-color catFISH and FISH/IHC can also be used to identify active neurons by labeling the expression products of other IEGs. For example, Arc expression in the brain after contextual fear-conditioning training or testing in mice has been shown to occur in two waves, one immediately after the training episode and the second 12 h later . This delayed wave of expression was detected by FISH imaging. Considering this, it would be possible to carry out second training or memory retrieval approximately 12 h after the initial learning episode and then to perform two-color catFISH or FISH/IHC to simultaneously visualize the second wave of Arc expression induced by the first episode and the first wave of the expression activated by the second episode. This possibility would further extend the framework for simultaneous visualization of several cognitive episodes within the same brain. Thus, the protocols described here can be used for the analysis of neuronal populations activated by engagement in at least two behavior tasks, where two stages of behavioral training or testing are separated by varying time intervals [34,35,36,37], or for comparative analysis of neuronal ensembles recruited into memory acquisition and its subsequent retrieval . The protocols described for two-color c-fos catFISH and a combination of c-fos FISH/c-Fos IHC detection allow optimized analysis of neuronal populations engaged in two distinct episodes of experience separated by a short time interval. However, it should be noted that activity-induced IEG expression is not a direct reflection of neuronal activity, with some neurons showing strong electrophysiological but not c-fos activation [39,40]. Furthermore, the expression of different IEGs is not consistent across various cell types and can vary between different brain regions or types of behavior, with some IEGs robustly activated by stimuli in some brain regions but having poor signal-to-noise ratios associated with other brain areas or behavioral tasks [41,42,43]. However, keeping these caveats in mind, using different colors to image neuronal activity in response to different cognitive events not only simplifies the process of manual analysis of labeled cells by the catFISH technique, but also offers a potential possibility for the development of color-based automatic cell counting methods. Compared with catFISH alone, the combination of FISH/IHC extends the time limit between the two cognitive episodes from approximately 30 min to 1–2 h, if c-fos mRNA and c-Fos protein are labeled. In addition, this method provides the potential to image neuronal populations that are active in more than two cognitive episodes. In non-transgenic animals, nuclear and cytoplasmic c-fos RNA labeling combined with c-Fos protein detection allows visualization of the neuronal populations activated by three cognitive events in the brain of the same animal. Using transgenic animals with fluorescent proteins expressed under the c-fos promoter would further extend the number of episodes that could be analyzed [44,45]. Such a multicolor labeling approach would allow analysis of the activation dynamics of large neuronal populations in the whole brain in relation to behavior. This opportunity may be further extended by the recent development of fluorescent labeling and imaging techniques for thick tissue sections, brain structures or whole animal brains [47,48,49,50,51,52,53]. Such large-sample and whole-brain imaging could be enabled by combining clearing techniques, such as CLARITY , CUBIC , iDISCO [49,50], with signal amplifying methods, such as hybridization chain reaction (HCR) [50,51], or tyramide-amplified immunohistochemistry (TAI-FISH) ). Novel combinations of these techniques will allow mapping of mRNA  or protein  as well as combined FISH-IHC detection of the IEG products  in the whole brain. This work was partially accomplished with the use of the resource facilities of the National Research Center “Kurchatov Institute”. KhS and AT developed and performed the experiments and wrote the manuscript. KA provided the idea and wrote manuscript. OS and FS developed the DNA probes for FISH. All authors reviewed the manuscript. This work was supported by the RFBR Grant № 16-04-01545A to KA, RSF grant № 14-15-00685 (mouse contextual conditioning) to KA, RSF grant № 16-15-10323 to FS and RFBR grant № 19-04-00395A to OS. Guzowski JF, Worley PF. Cellular compartment analysis of temporal activity by fluorescence in situ hybridization (catFISH). Curr Protoc Neurosci. 2001; 15: 1.8. 1-1.8. 16. Alberini CM. Genes to remember. J of Exp Biol. 1999; 202: 2887-2891. Kaczmarek L. Gene expression in learning processes. Acta Neurobiol Exp. 2000; 60: 419-424.